Remote and little-known points of historical interest rank high on my list of places to explore. When these places also provide a free place to camp (typically boondock), I like them even better. A free attraction combined with free camping makes for a low-cost weekend of getting out of the house and enjoying public land. One such place that has been on my radar for years, but hadn’t been marked off the list yet, was the old Boylston Tunnel and adjacent townsite (rail stop) of Boylston, Washington. The main reason I hadn’t been there yet was that it is set in the middle of the US Army’s Yakima Training Center. The only legal access to the site for civilians is via the old railroad bed which is a rails-to-trails conversion and part of the John Wayne Trail (aka Iron Horse Trail). This section of the trail is only open to hikers, bicycles, and horses. The distance between the nearest trailhead and the tunnel is just over 6 miles with an elevation gain of approximately 600 feet. Not only was the over 13-mile round trip to and from the tunnels discouraging enough, but the fact that the trail runs through desert scrub with no options to rest in the shade while traveling it kept it from rising to the top of the list. 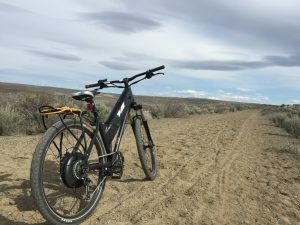 So when I was offered the use of two electric pedal-assist bikes, discovered you could camp for free (with permission) at the trailhead, and with the promise of a few days of dry sunny spring weather, it went to the top of my to-do list. With written permission granted from the US Army and the bikes charged and loaded into the back of the truck, it was just a matter of driving to the trailhead, unloading the bikes and letting the bikes do most of the work buzzing us up the old railroad grade to the tunnel and old townsite. After exploring, it was just a matter of heading back and cooking dinner in the trailer. Something I didn’t know in advance is that this section of trail is very sandy and it would have taken a lot of extra effort to hike or ride on conventional bikes. I highly recommend PIM Bikes if you are getting older and enjoy bike riding, but your body isn’t quite up to the task any longer, or you are like me and like to visit quirky, out-of-the-way places where you can’t always drive a conventional motorized (gas-powered) vehicle. 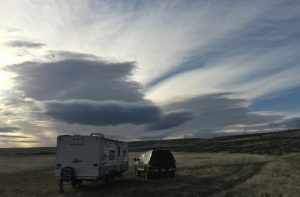 This campsite photo was taken at the Kittitas trailhead where there are acres of available space to camp on. To obtain written permission call 509-577-3337. There are vault toilets at both trailheads, but no potable water. You will find the west (Kittitas) trailhead off Boylston Road, the east (Doris) trailhead off Huntzinger Road. 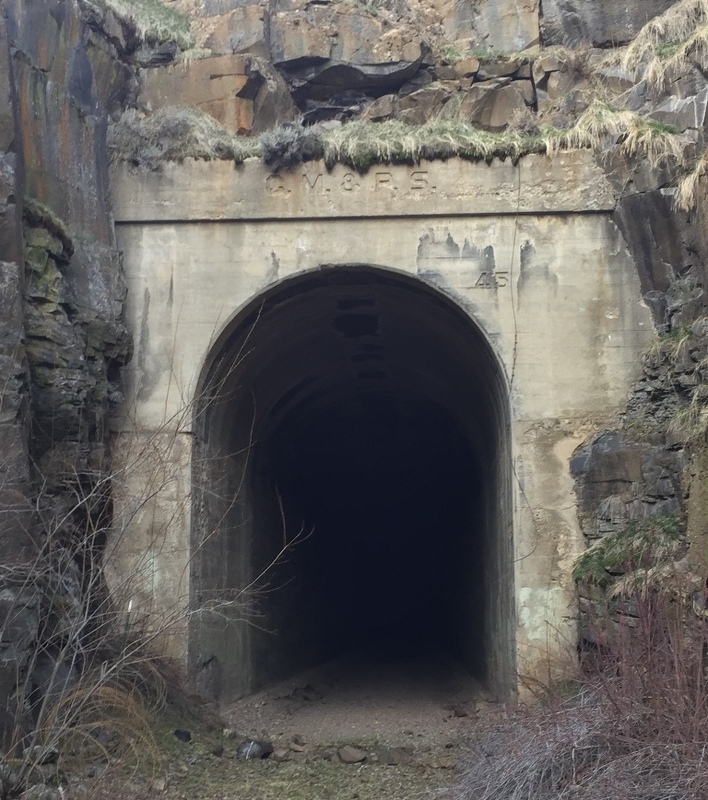 Note: While there are no gates or signage keeping you from entering the tunnel, Washington State Parks and the Yakima Training Center consider the tunnel closed due to the potential of falling rock. A bypass trail is in place that takes you up and over the tunnel. Sounds lovely! Is it possible to get there in an RV? Sorry, you can’t get there via RV. 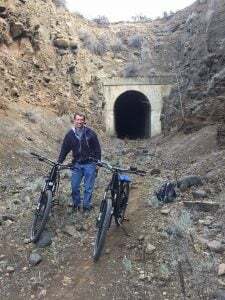 As stated in the blog, the only way to the tunnel is via the old railroad bed on foot, horse or bicycle.